Payment of bills and taxes in Bulgaria can be a nightmare, and if you try to undertake this yourself you can lose days of your valuable holidays on the most mundane of issues. You are also required to have a Bulgarian accountant submit annual accounts for your company if you have one. The initial registration of utility accounts is carried out at the local office responsible for your area and involves a great deal of form filling, queuing and paperwork. There are other obligations on you as an owner to declare information about your new Bulgarian property which it is likely your estate agent will not have done for you. 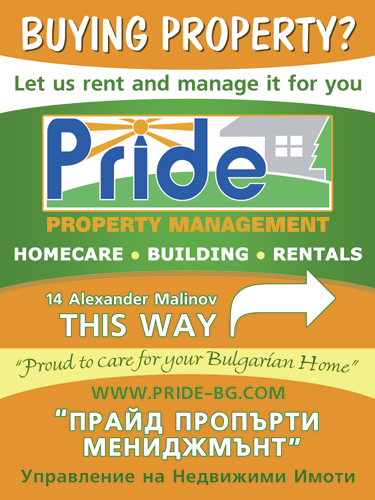 The good news is that Pride's Bulgarian property management service is here to help! Our service includes representing you by Power of Attorney for all of these important jobs. Our Bulgarian Power of Attorney is very specific for the jobs we need to carry out and we specify that we will not have any rights to sell your property or to mortgage it, which is a worry many people have when giving these responsibilities. If you already have a person to whom you have given this responsibility we can discuss the best options to work with you. If you have set up a Bulgarian company to purchase your property, there are several other tasks we will perform to keep the company paperwork up to date. Every six months we will also take a certificate from the regional court where your company is registered to prove that you do have any outstanding taxes or other liabilities. Additionally it is a legal requirement that you submit a company tax declaration each year, even if you have not traded, and our Bulgarian accountants in Varna and Dobrich can complete returns for all our clients at a very reasonable rate. We have gained extensive experience in dealing with all kinds of unusual and complex issues related to water and electricity connections, be it a lost account, illegal connection or new utility supply in Bulgaria, please speak with us if you are experiencing difficulties and we will advise you how we can help to register your accounts property to avoid fines or disconnection in the future. We will open a bank account in your name to hold an expense fund and for depositing rental incomes. Pride recommend ProCredit Bank which have English-speaking branch and call-centre staff to assist you at any time. The internet banking allows you to log on and check your account to reconcile rental income deposits against your Pride Property Management and Rentals client statement.